How the UN is Used to Destroy African Sovereignty | .:TesfaNews:. The UN was established by the United States in collaboration with England at the height of Second World War. Franklin D. Roosevelt and Winston Churchill spent a great deal of time in Washington crafting the language and the framework for an organization that has become a major tool to further the agenda of Western nations led by the US. Summary: the UN is an international organization set up to represent all members in pursuit of world peace, respecting sovereignty and the right of self-determination without interference. To that end, the UN is accorded some mandates. As it stands, five veto wielding Security Council members run the UN. Of these member states, the United States is the hyper-power that is largely responsible for the stream of agendas that flow into the council. The US, as history attests, is the principle author of the language, principles and standards that govern the current UN. As it stands, the United Nations Security Council (UNSC) is a world body that empowered itself to be the judge, jury, prosecutor and solicitor general. And as it stands, the hyper-power US is dictating the terms, issues and agendas that appear before the supreme UN council through mechanisms, and blue print it established to suite its global hegemonic agenda. There is no way, say, Uzbekistan or Nicaragua can effectively forward agendas that serve their interests unless it accommodates the interest of the US. As a result, many nations have effectively given up on the UN’s process and effectiveness. Hence, when these countries participate, it is often under duress, manipulations, and outright threats and when that all fails, use brute force. The UN, as it currently stands and as history attests, is an organization not serving the interests of all its member states or forwarding the agenda of peace. The principle tenets outlined on the mission and purpose statements are not adhered to, as they should, if at all. Rather, it is agent of the US and the West primarily, and to some extent the other members of the Security Council. And instead of working for peace, the UN is a destabilizing tool the West employs to rob Africa and other developing nations of their resources and strategic locations. The “Non Interference” claim is irrelevant since the UN is manipulating resources of countries of interest through its Sanction Regimes. This poses big problems for Africa and developing countries that poses no power to set or forward agendas of their interests. No country in Africa has a say when it matters or the power to influence decisions based on their interests. No nation can forward its interest alone if it does not serve the interest of the US. It is US interest or no interest. The Security Council (SC) is set up like the US Supreme Court divided to two camps where Russia and China are normally on one side and Great Britain and France on the other with the US acting as the supreme judge. In the Security Council, small countries are irrelevant. There is no mechanism for small countries to challenge the process. They cannot have legal defense. It is nearly impossible to challenge any accusation because there lacks a mechanism to prove guilt beyond reasonable doubt. There is no cross examination to challenge the accusers. The burden to prove innocence is on the accused and to make it worse, the charges are numerous, impossible to challenge and could be changed without notice. The best way to explain the UNSC is to liken it to the US Supreme Court without the presence of lawyers. It is like seeing judges deliberate the sentencing of the accused, and to make matters worse, these are biased judges with interests on the line. To see these lopsided process all we have to do is look at the current inhuman, hawkish US Ambassador to the UN Susan Rice in action as example. Ambassador Rice’s principal goal is to ram resolutions at the Security Council irrespective of the consequences to the people impacted, irrespective to due process and the rights of the accused. She is the supreme judge that throws tantrums when she couldn’t get her way. That is the reality of the UN Security Council. We see it played-out on Syria with unremitting pressure applied to sway Russia. We saw the manipulations to pass the “No Fly Zone” resolutions against Libya which finally turned into a full invasion of a sovereign nation under the guise of humanitarian intervention. The examples are too many to detail. As a result, Eritreans suffered untold atrocities at the hands of successive US supported Ethiopian leaders for decades. It is a historic fact that Eritrea’s struggle for independence was waged indirectly against the US until 1975. Eritrea’s strategic importance for the US is critical. The US had a base in Eritrea until 1975 when it was forced to vacate. It is therefore futile to see US actions against Eritrea in isolation. One has to look at the current developments in the Mediterranean Sea where, after the ouster of Gaddafi NATO/US have almost seized the entire Mediterranean Sea minus Syria. US/NATO nations are controlling the Mediterranean Seas under the guise of controlling nuclear proliferation. In the Indian Ocean US/NATO forces are roaming openly under the guise of fighting piracy. The only open water that the US and NATO forces have not been able to roam freely is, and remains the Red Sea. In the Red Sea, the US has not succeeded its pursuit of Eritrea using its puppet regime in Ethiopia. Sudan is still not in US’s camp. The situation in Yemen and Egypt remain volatile with US playing detrimental roles. Hence, the US is conducting undeclared Unconventional Warfare against Eritrea directly using all powers at its disposal. These include all destabilization strategies short of boots on the ground that includes economic, political, humanitarian, diplomatic and military. The people of Eritrea find themselves under unremitting US pressures in every direction every day. One of the most potent tools the US uses against nations like Eritrea is the UN. The UN is a tool that legitimizes illegal actions on nations. 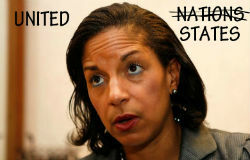 All the supreme judge Ambassador Susan Rice needs is, accusation that favors her case to push the agenda. In 2011 Ethiopia, a nation that declared war against Eritrea was, allowed to present a fabricated story about plotting bombs at the AU and Ambassador Rice took it to the UNSC to pass a sanction measure without evidence. Rice took the accusation presented by Ethiopian authorities as fact and urged the UNSC members to accept it face value. That is when the Russian Ambassador to the UN Vitaly Churkin rejected the accusation for lack of evidence. The watered-down version of the sanction measure passed anyway without due process or fair representation of Eritrea’s case. The battle to convict nations like Eritrea is waged in the court of public opinion. That is how the US makes cases to convict small nations. The demonizing campaigns are sophisticated, unrelenting and consistent. All types of NGO’s are utilized to make the fabricated accusations appear factual. Human Rights Watch, Amnesty International and other NGO’s are tools that they use to convince the unsuspecting public. When CNN and the other megaphones push this bad news then the fix is in. That is the way they apply pressure on the non-permanent members at the UNSC. The history of the UN is one of corruption and infectiveness. Yet, it is a tool of choice and has been a very useful tool for the US particularly after the fall of the Soviet Union. During the Cold War, the US and the Soviet Union had competing global agendas and interests. This made the UN a-none factor because the US and USSR, both veto wielding countries did not see eye to eye philosophically and strategically, which meant nothing could be achieved through the UN. Hence, there was no dominant voice at the UN because they can strike each other with a veto. Coup d’état was a way they conducted regime change in countries of interest. Up until 1993, the prevailing opinion in the US was that the UN is corrupt. And if we look back at the period leading up to the first Gulf War, Secretary General Kofi Anan was maligned due to charges of corruption. In 1993, after the US was humiliated in Somalia and the Rwanda Genocide of 1994, the New World Order George H.W. Bush professed started to take shape whereby, the US as the sole super power dictating the terms and agendas around the globe. Since then, the UN has become a tool for US and the West in their quest to dominate the globe, and its resources. In the preceding years since, the US has managed to dominate the UN and passed resolution after resolution on the quest to secure its strategic interests in a stealthy fashion with lightning speed. There hardly existed any challenge to US’s dominance for nearly 20 years. In that period, the UN became the extension of the US state Department. The Secretary General’s office is simply a megaphone for US agenda. The UN Secretary General is not a neutral UN employee. He must account to US directives. In June 27, 2012, Inner City Press reported that Secretary General Banki Moon took-down official report, “Report of the Secretary General on Eritrea” after he posted it as official UN document. Of course, Secretary General Moon was pressured to take down the report by the supreme judge Rice because the document had some favorable report about Eritrea. The US Supreme Court allows cases to fully develop before it could take on a case. The cases are, normally debated in lower courts before the court can take them. There are precedents and legal languages used in state and local courts to streamline the process. The right of the minority and representation of the accused is established practice. Yet, the US sees no need to apply the same standard at the UN. The UNSC, the supreme judges of the world have become the international court without any checks and balances. The world is not set up like the US. It does not have legal structures similar to the US’s local and state level jurisdictions that define laws and legal norms. As long as there is intent to prosecute what Rice needs is to make a case in the court of public opinion. To buttress her assertions and accusations she needs regional organizations like the Arab League, Friends of Syria, African Union, IGAD, ECOWAS etc… and when needed, to establish groups like the Somali Monitoring Group that it can easily manipulate to support her claim so she can apply pressure on the Chinese and Russians at the Security Council. The motive behind any measure at the UNSC is strategic interest. No humanitarian issue receives consideration unless it serves their strategic interest. In Somalia, the human rights violations by AMISOM, the US and Ethiopia is leaving a lasting legacy that will affect the people of Somalia for generations. Kids are growing without educations, neighborhood wiped out with drones. Social infrastructures that render services could not develop; health and community well-being is not a consideration. Culture, music and developing viable communities that nurtures societies are not consideration. To the contrary, criminals that are committing genocides are allies the US uses to continue ill-conceived inhuman strategies. In order to push US agendas the African Union in Ethiopia is a gateway to manipulating African matters as evidenced by Wikileaks cables that shows heavy-handed approach by US officials on African leaders. For the US, in this budget crunch times, the UN and the outlined process is the cheapest way to accomplish things. It costs almost nothing and requires no sacrifice. The average person or small countries have no recourse to address injury or harms done to them. The UN and UNSC are out of reach to the people of the globe. Any party can demonstrate outside the UN grounds but no one will listen, they don’t have to. So what can the average person do to fight the UN or UNSC organizations that have become agent of human atrocities surpassing past holocausts of the world? The public needs to be aware, organize, educate and act. There is no way to address the UN or make the UN accountable for its actions. However, it is possible to reach elected representatives and most importantly the President himself. He is the one that appointed the hawkish inhuman Ambassador Rice to the UN elevating the position to a cabinet level. It is critical to reach out to everyone everywhere to educate people the harm that is done in the name of the UN. No CNN or ABC will educate the public; it is the responsibility of the people to be educated. It is also an opportunity to unite behind a real cause that is so important for humanity since much damage is done in the name of human rights. Strength, unity, determination and brilliance are required to fight the agent of global holocaust, the UN led by United Nations Security Council. This entry was posted in News and tagged African Sovereignty, African States, Destroy, developing countries, Djibouti, ECOWAS, Egypt, Eritrea, Ethiopia, Franklin D. Roosevelt, Human Rights Watch, IGAD, John Foster Dulles, Kenya, Peace, Sanction, Security, Somali Monitoring Group, Somalia, Sovereign States, Sudan, Uganda, UN, UN Principles, UN security council, United Nations, UNSC, US, Vitaly Churkin, Winston Churchill, Yemen. Bookmark the permalink.